their exceptional milk profiles for cheesemaking, good grazing abilities, and hardy constitutions (important during the laughably bitter hilltown winters). We’re constantly amazed at their intelligence. 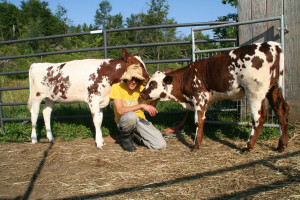 Cows are wonderful animals when they are treated well and given a chance to be themselves. We try to maintain the cow’s environment in a way that minimizes stress – no crowding, lots of sunlight, easy and clear paths, fields with windbreaks. 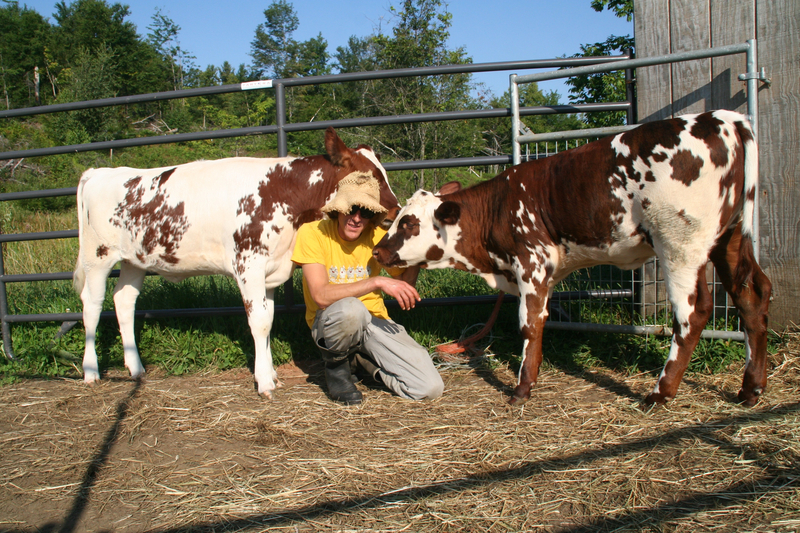 We treat the cows with dignity and kindness and they respond by generally being delightful. We practice animal-based husbandry – the centerpiece of which is rotational grazing during the season. Every 12 hours we move the cows to a new paddock and give them fresh ground. They usually return to that spot about 30 days later, when the field is all grown back. Rotational grazing is good for the land, which in turn is good for the animals. The fields have time to regrow, manure is distributed evenly, and moving animals are far less prone to parasites and disease. 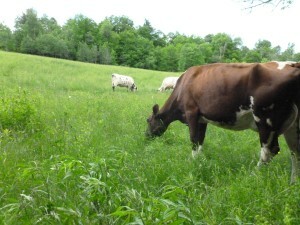 As an added benefit, our cows don’t get bored, as they always have the next pasture to look forward to. Animals (us included) benefit greatly from expectation – it keeps them engaged and reduces depression. 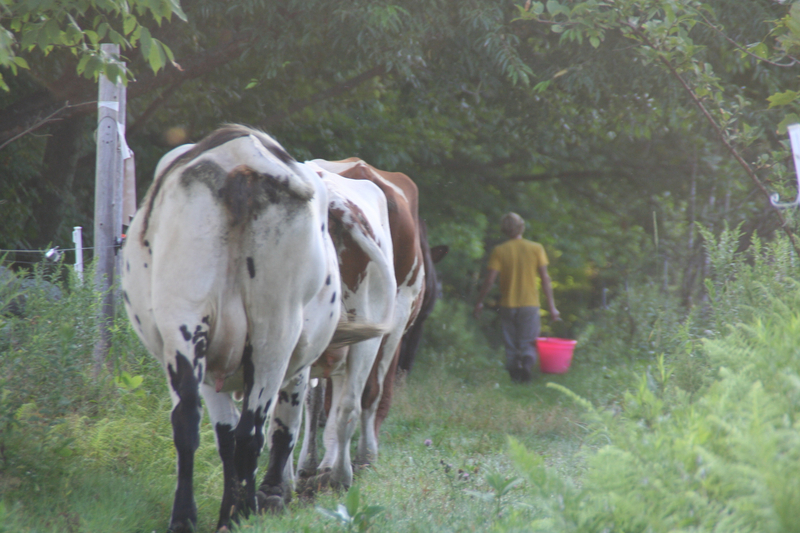 Every time we move the cows they get excited – even if it’s just to the next ten feet of pasture that was fenced off. They run into the paddock and explore the whole area. Cows love to explore things. dry the cows dry off and they spend the winter eating, resting, and being pregnant. This schedule most closely resembles a natural cycle, as most ruminants would give birth in the spring and nurse their babies for five months or so. It’s easier on the cows, as they get a break from the demands of milk production, and easier on us, as we get a break from the demands of milking. Under this system we can expect our cows to be with us for over 10 years, and our bodies to hold up for a few decades at least. During the winter we feed hay, and the cows have a field to run around in and free access to a pack-bedding barn, which they usually only choose to go into to sleep. Pack-bedding barns are a wonderful way to house animals during the winter. The barn is an open, bright space that we fill with wood chips and then add a layer of sawdust every day to cover the manure and give the cows a clean, dry place to sleep. The pack builds up over the winter to about four feet deep. As this material breaks down (composts) it gives off heat – creating a warm surface the cows love to sleep on. In the spring we clean out the whole thing and spread the rich compost on the fields. 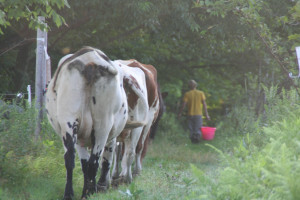 Healthy animals, no piles of manure, no smell, and plenty of food for the fields.